With complex statistical techniques, and a quickly expanding universe of data drawn from an increasing number of our behaviours online and offline, a multitude of organizations and institutions are using predictive analytics to do that which has always fascinated and eluded the human race -- predict the future. A man walks into a Target in Minneapolis. Coupons in-hand, he demands to see the manager and boy is he angry. "My daughter got this in the mail!" he says. "She's still in high school, and you're sending her coupons for baby clothes and cribs? Are you trying to encourage her to get pregnant?" The manager looks at the coupons. They are addressed to the daughter and contain ads for maternity clothing, nursery furniture, etc. The manager apologizes. "I had a talk with my daughter ... It turns out there's been some activities in my house I haven't been completely aware of. She's due in August. I owe you an apology." You read correctly. According to the New York Times, a retailer knew that a girl was pregnant before her own father did. You didn't think those loyalty cards were just for a dollar off milk, did you? A revealing trend many years in the making is now coming into public view. Did you see the report that the mood on Twitter has been shown to predict the rise and fall of the stock market? How about Facebook's claim that they can predict election results? Or that Google apparently predicts flu outbreaks more accurately than the US Centers for Disease Control. What is going on here? 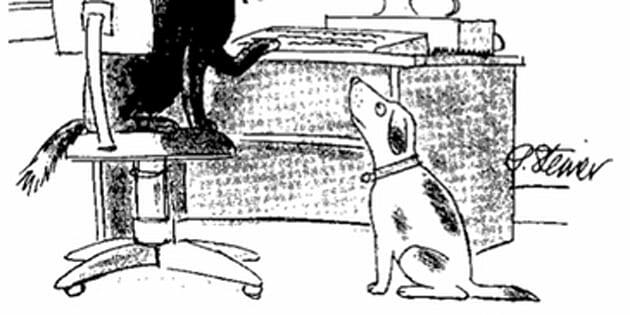 The answer: predictive analytics. This Wired piece about the U.S. National Security Agency's new "spy center" capable of dealing with yottabytes (1024) of data. The Google Flu Trends site -- especially the "How does this work?" section. This Wired piece about Twitter predicting the stock market. This NYT piece on Facebook's own facial recognition efforts and this piece on Wall Street's call for Facebook to start making money from their "trove" of data. This article from Daily Tech about police scraping data from mobile phones. "The strangest thing happened to me the other day. I broke up with my boyfriend on Monday, and on Tuesday Facebook was advertising Häagen Dazs ice cream on my profile. How did they know I wanted ice cream?" I replied, "Did you change your relationship status from 'In a relationship' to 'Single'?" In the online space, predictive analytics have a best friend: web tracking. The process of collecting data from as many of your online behaviours as possible, web tracking involves watching where you go online, what you search for, what you post, where you click, what you buy, what you don't buy, etc. Web tracking is taking place on your device right now, whether you're reading this article on your laptop, your desktop, your smartphone or your tablet - if you're online, chances are you're being followed. As seen in this YouTube clip, a 2010 ABC News report found that a simple visit to what appeared to be a harmless website resulted in the user being followed by nine web-tracking services. Last year, Max Schrems, a law student from Vienna, requested that Facebook provide all the data they had collected from him since 2008. The dossier they sent was 1,200 pages long -- and that was just his Facebook use. Imagine if he had contacted Google! The Internet has certainly changed a lot in the last 20 years. 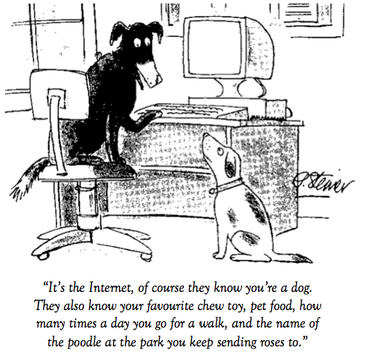 In 1993, the now famous cartoon from The New Yorkerhad the caption: "On the Internet, nobody knows you're a dog." What's scariest is that the iceberg analogy applies. When you use Gmail you notice ads running at the top and side of your page. You wonder, is Google reading my emails? On Facebook, you do the same. What you're seeing is just the tip of the iceberg. As a universe of personal information, growing exponentially by the second, expands beneath the surface, industries and governments are rushing to figure out how to benefit from this "trove" of data. If this reality doesn't bother you, great, at least you've made that decision. On the other hand, if what you've just read concerns you, if you feel your privacy and civil liberties are being threatened, I encourage you to speak out. Review the work of the Canadian government's Office of the Privacy Commissioner. Check out Openmedia.ca's "Stop Online Spying" campaign. Read about the call for a Canadian Minister on Digital Policy by the Senate Standing Committee on Transport and Communications. Have a look through the Consumer Data Privacy Bill of Rights put out by the White House this year. Most importantly: Contact your representatives and let them know that our private data is just that. It's official, Target is now in Canada. Finally! "It's 10 o'clock. Do you know where your children are?" *Thanks to Arvind Narayanan for this interesting idea.